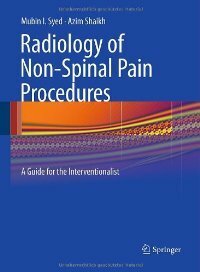 Mubin I. Syed, Azim Shaikh, "Radiology of Non-Spinal Pain Procedures: A Guide for the Interventionalist"
This handy, well-illustrated manual has been designed to meet the need of interventional pain physicians to understand the radiologic imaging involved in the performance of non-spinal pain procedures. It provides information on such topics as radiologic anatomy, the radiologic manifestations of indications and contraindications to interventional procedures, and the radiologic appearance of complications that may arise from these procedures. In addition, it will be useful for the diagnostic radiologist, who may be unaware of many of the interventional pain procedures. The chosen format will ensure that the reader is quickly able to reference any given procedure. As this is a guidebook, it does not encompass every pathologic entity that may be encountered; however, the commonly performed non-spinal pain procedures are included. This text will prove essential for any interventionalist who does not have easy access to a radiologist and vice versa.